I was so busy on the day, this is the best photo I got of Tom's birthday cake. 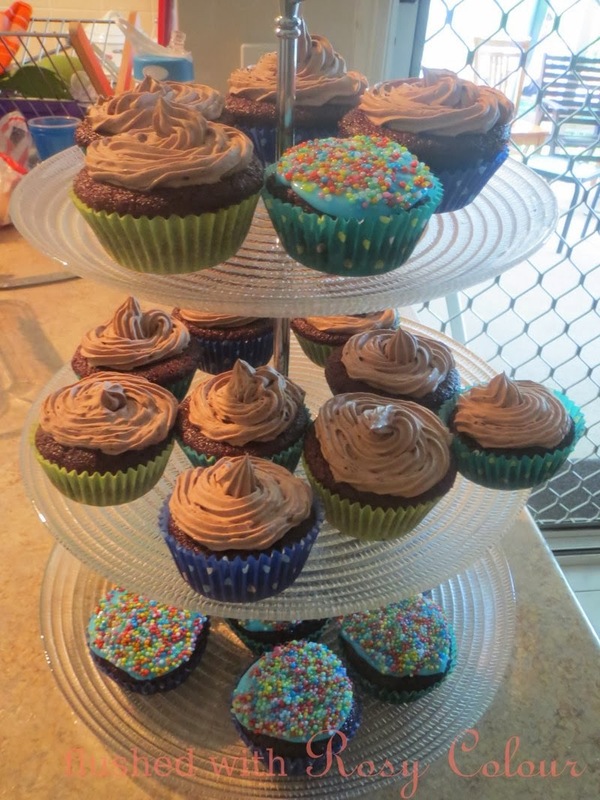 We made gluten free chocolate cupcakes. We found the gluten free chocolate cupcake recipe at the Healthy Chef. The recipe says 2 tablespoons of honey but we thought they weren't sweet enough so we added 4 tablespoons of honey instead. They're quite delicious with double the amount of honey. We iced some cupcakes with icing sugar and 100s and 1000s for the kids and my husband who is on a dairy free diet at the moment. But most of the cupcakes had piped stevia butter frosting on it. We found the recipe for stevia buttercream frosting at Wholesome Sweeteners. Instead of lemon flavouring, we added a teaspoon of cocoa. With a lot of diabetics at the party, these cupcakes were just the treat.